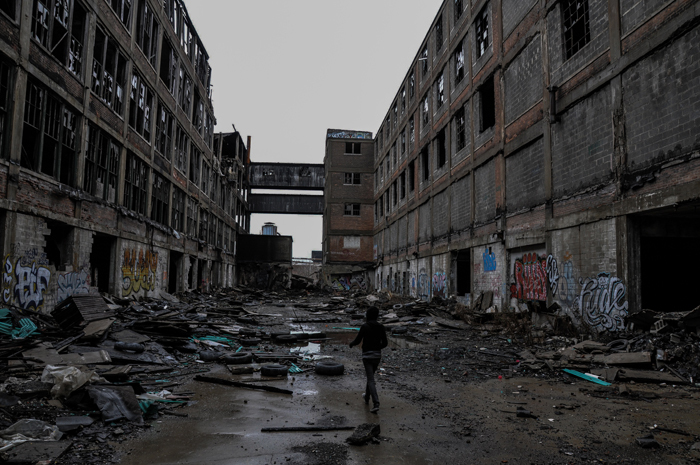 Not long ago my I took a wrong turn on the expressway while driving through Detroit and found myself in an abandoned industrial part of that city. As I drove past giant abandoned warehouses with gaping holes where there were once windows and peered down dark streets at shadowy human figures, I found myself praying that my car did not break down and that all traffic lights ahead were green when I got to them. That drive through dark dead Detroit was probably the spookiest trip I have ever made. After leaving the industrial section I came upon neighborhoods of dilapidated and abandoned houses. I searched frantically for a way back to the expressway and an exit from the most uncomfortable place I have ever found myself in. Detroit today is a dying city. It is so eroded with closed and abandoned factories, vacated and abandoned houses and roaming gangs of thugs that few people dare to venture there, especially after dark. My heart went out to those still forced to be living in such a place. It was not surprising when the Detroit bus drivers union recently walked off the job after one of the drivers was beaten by a gang of about 100 young ruffians and hospitalized. The bus drivers demanded police protection before they went back to their jobs. Few choose to live in Detroit any more. Some cannot move away because they cannot sell their homes or they may hold some form of employment that they dare not give up. The job market is bleak in Detroit as it is all over the nation. The great automobile plants and other manufacturing plants that once thrived there have closed their doors and moved away. Empty stores and houses are a blemish on the city. The city's population has plunged from 1.8 million in 1950 to less than 700,000. Thus vast areas, estimated to total 30,000 acres, have created what some writers have dubbed an "urban prairie" of green grass and trees. Packs of wild dogs roam the empty haunted buildings that once housed a viabrant industrial and commercial community. There have been efforts at urban renewal. Large blocks of property along the Detroit River have been cleared and developed in an effort to revitalize the downtown. There is Cobo Hall, and other major developments in the area that still bring business and conventions to Detroit. But the decay can be found within only a few blocks. The schools in Detroit are so broke and overcrowded and entire buildings are being closed and classes are doubling up to save money. Discipline and order in the classrooms are problems. Woe on the teachers caught up in the Detroit Public School system. The state, which is also broke, is offering no help. State education money is being reduced for lack of tax dollars. Federal aid to schools also is drying up. The schools were closed when teachers recently walked off their jobs over salary and other issues. A city-wide decision to shut off water service to delinquent users left many of the struggling, jobless residents struggling to meet essential needs. While the numbers of residents dropped, crime has skyrocketed. It wasn’t always like this. I remember a time when Detroit was a thriving city. It was a place to go for theater, good jobs, an exciting day trip on the steamboats to the Boblo Island amusement park, and the State Fair. I had an aunt and uncle who lived in River Rouge and remember spending time with them. It was always exciting to go their house. In my college years I dated a girl who worked in Detroit and remember spending many fun weekends with her in that city. We saw the musical Porgy and Bess in a large theater there. I traveled to Detroit with college friends to attend concerts by top jazz artists of the day and saw my first and only real burlesque show. When our children were young my wife and I took the family to various excursions to the Detroit Museum of the Arts, the nearby historical museum, and to Greenfield Village in nearby Dearborn. I spent hours in the Detroit Public Library, reading newspaper microfilm files in search of shipwreck stories on the Great Lakes. We made frequent visits to the Detroit Municipal airport as our children flew off to various parts of the world. My wife and I celebrated our Twenty-fifth wedding anniversary at the Ponchatrain Hotel on the Detroit River. Yes, we remember when Detroit was a thriving and reckless city. We got caught in terrible traffic jams on I-94 and I-75, just trying to get in and out of that place. We learned not to drive on those highways at certain times of the day, mostly when people were coming or going from their jobs, or to or from Tiger Stadium. From its origins, Detroit was always a thriving place of commerce. It was a port city. A shipyard. A fortified place first occupied by the French and later the British before Michigan became a United States colony. Detroit was established by a Frenchman, Antoine de la Mothe Cadillac, in 1701 as a fur trading center along the Detroit River. There he erected Fort Ponchatrain du Detroit. The village that sprang up around the fort eventually became known simply as Detroit. Detroit came under British rule during the French and Indian War in 1760. A major fire nearly destroyed the city in 1805. But Detroit could not die. It continued to be a strategic port serving the Great Lakes so it rebounded quickly and grew to become among the largest and most important industrial centers in the United States. It was the home of Thomas Edison, Henry Ford, and the center for such automotive giants as General Motors, Ford Motor Company and Chrysler Corporation during their heyday. The city’s auto plants were converted almost overnight to build the nation’s war machines during World War II. Alas, change has fallen upon the nation. Can Detroit survive what has happened to it? Can it ever rise to experience the greatness this city once enjoyed? The historical places are still there. The great highways still pass through Detroit. A lot of empty buildings are still sound and awaiting some repair and tender loving care. A lot of people are in desperate need of jobs and places to live. The city is ripe for renovation and creative innovation. Will the state and federal lawmakers act to open the doors to a brighter future for this old city? Can the citizens of Detroit raise themselves up by their own bootstraps and find ways to work the magic that is needed to save Detroit from its own decay? We are happy to say that there has been an awakening in the downtown area and in old residential neighborhoods, especially along the Detroit River. Old dilapidated buildings that have either burned or been demolished have opened space full of rich flood-plain soil that are being turned into large community vegetable and fruit gardens. There are still signs of life in that historic old city, but the so-called "rebound" has been slow.